Highway construction projects around the nation are likely to be delayed or cancelled if Congress does not fix the underfunded Trust Fund. 253 House members are backing a plan to include a permanent Trust Fund solution in any tax reform legislaion. TxDOT Executive Director James Bass joined with the CEOs of all other state highway departments in urging Congress to make a permanent fix to the ailing Highway Trust Fund as lawmakers take up tax legislation. The 52-member board of the American Association of State Highway and Transportation Officials voted recently, to endorse the policy position developed by a joint committee of AASHTO, the American Road & Transportation Builders Association and the Associated General Contractors of America. The Highway Trust Fund takes in far less in dedicated road user excises tax on motor fuel and trucking equipment than it spends on federal-aid highway and transit programs, forcing Congress to repeatedly shift general funds to bail it out. The current five-year funding bill covered the shortfall through 2020, but after that the trust fund would once again need a congressional bailout from other revenue sources to cover an estimated $18 billion annual gap unless lawmakers provide it with a sustainable source of dedicated receipts. 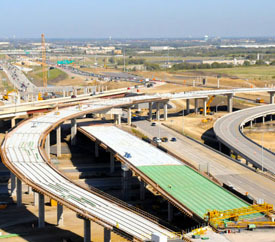 In the AASHTO-ARTBA-AGC Joint Committee resolution, the industry groups warned that as the 2020 expiration approaches, "it is likely that several state transportation agencies will begin delaying or canceling projects because of the long-term uncertainty in federal funding, thereby lessening the associated transportation and economic benefits for their respective states." Until now, there has been no congressional consensus around specific tax or user fee increases to help pay for transportation system needs, but various observers have suggested that Congress could opt to do so as part of a broad tax overhaul. Among the ideas that have been floated are using a onetime windfall from repatriating foreign-held profits of U.S. companies for transportation, or indexing the trust fund's excise fees for inflation. The industry groups in their resolution noted that "over the past 30 years, all revenue enhancements for the Highway Trust Fund have come through larger tax and deficit-reduction legislative packages." Now, the Republican majority in Congress has proposed wide-ranging tax cuts that begin the open discussion of tax reform, which President Trump has listed along with infrastructure investment as among his top legislative priorities. The industry groups also pointed out that "253 members of the U.S. House – representing a majority of members from each party – recently signed a letter to the leaders of the Ways and Means Committee urging them to include a permanent Highway Trust Fund solution in any tax reform legislation." The groups said that was "an example of the broad bipartisan support for this approach in Congress." So they called on both Ways and Means and the Senate Finance Committee "to include a permanent Highway Trust Fund solution and transportation infrastructure funding in forthcoming tax legislation, in order to address this issue as soon as possible." In another resolution AASHTO members pushed back against the notion that federal transportation funding discourages state and local investment. In fact, they said, state and local governments pay for 80 percent of the nation's overall investment in highway and bridge infrastructure and 74 percent of transit spending. And while the U.S. Constitution "deems investment in transportation infrastructure as one of the few core responsibilities of the federal government," they said that in view of the huge backlog in investment needs, "further strengthening and reaffirmation of the federally assisted, state-implemented foundation of the national program is even more critical now than in the past."